Iowa winters have arrived, and temperatures are dropping below zero fast, which means that it’s time to bundle up; put the shorts and flip-flops away for the season and get out the scarves and winter jackets. But plain gloves aren’t going to keep out the harshest winds that winter can bring, so a way to keep your hands from feeling as cold as icicles. 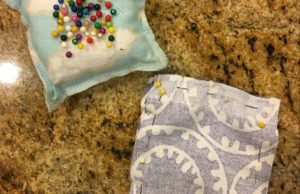 Hand warmers are an easy way to keep your hands nice and toasty in less than a minute, and this quick DIY will show you how to make your own. 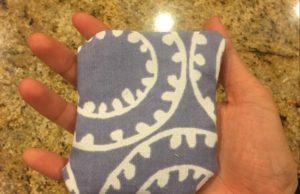 Cut out two pieces of fabric with a length and width of about 3-4 inches. You could try out different shapes if you wanted, but I settled with a basic square. This DIY is also a perfect and useful way to use any scrap fabric that you have lying around and don’t know what to do with. You can get as creative as you want with your choices of fabric by mix-matching fabrics or choosing a plain fabric that you can design yourself with some fabric markers. Pin around the edges of the two pieces of fabric, leaving about a centimeter on the outside. Make sure the sides that you want on the outside are together, so that the fabric is inside out. Glue together the articles of fabric, only applying glue to the centimeter of fabric on the outside of the pins. 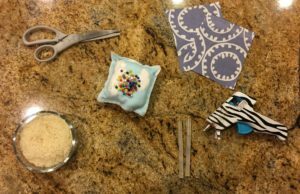 An alternative to gluing is sewing, but I find gluing easier and less time consuming. Glue three sides of the square, but leave a decent-sized hole on the last side before gluing and turn the newly made pocket outside in, so the side of the fabric you want showing is on the outside. 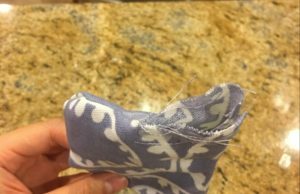 Fill the pocket with the grains of rice, but I recommend not stuffing the pocket completely, as it will make it harder to seal the hole. Leave a bit of space for the rice to move around inside. Secure the hole with glue so you won’t have rice spilling out, as it’s a pain to clean up. And you’re finished! Throw your new reusable handwarmer in the microwave before you face the cold for 20-30 seconds. If you’ve used glue, heating it for any longer can be disastrous, because not only will the glue melt and leave you with holes in your pocket that rice can escape out of, but you’ll have hot glue and hot rice on your hands that is prone to burn you. Enjoy your new handwarmer, and make it your new best friend for this freezing weather!